February 6, 2013 – A Socialist in Canada, posted at Links International Journal of Socialist Renewal with the author's permission -- ”France is in Mali for the long haul.” That’s the headline of the France daily Le Monde on February 4. The newspaper’s front page, as well as pages 2 and 3, were devoted to a discussion over "what next" for France and the world in Mali. The views of the newspaper’s editors are explained in a front page editorial. (The editorial translated into English is below.) Describing in the politest of terms France’s historic role in Africa as a slave and colonial power, and summarising the political situation in Mali and west Africa as a “struggle against narco-Islamists”, the newspaper argues for a long-term, Haiti-style tutelage of Mali. France’s imperialist allies in Europe and North America can be expected to seamlessly concur. Intense discussions to this effect are underway at the UN Security Council. Several important differences with Haiti are already evident. For one, France want the neighbouring, neocolonial regimes of west Africa to eventually carry the lion’s share of responsibility for a police/military occupation regime. Yet, echoing statements by French military leaders, Le Monde’s editors acknowledge that the arming and training of an African force is going to take many months and positive results are not guaranteed. These same African forces have been “trained” by the US, European and Canadian militaries for some years already with seemingly little to show. So that leaves France staring at the uncomfortable prospect of bearing the lion’s share of what by all appearance will be a long occupation ("France is in Mali for the long haul"!). The pages in Le Monde are filled with news and commentary about this dilemma. Again on the Haiti analogy, it has been nearly nine years since the Security Council’s MINUSTAH force in Haiti landed, three months after the overthrow by US-backed paramilitaries of the elected government. Two, France wants international endorsement and participation in its project. It has already received the enthusiastic participation of its principal imperialist allies. It obtained an endorsement for an “African-led” military force in the UN Security Council resolution of December 20, 2012. But whether this will prove as lasting and universally supported in the halls of the Security Council as MINUSTAH has been is another matter. An informative news article (in French) in the same issue of Le Monde summarises the history of the Touareg national rights struggle. Where does the French left stand in the face of all this? The daily newspaper of the Communist Party continues its support for the intervention. A published report last week on French president François Hollande ‘s visit to Mali was headlined, 'Hollande in Timbuktu: 'I don’t wish to meddle in the political life of Mali''. The paper is routinely summarising in its pages the declarations of the French government and military. A statement by members of the New Anti-Capitalist Party (NPA) charts an entirely different course. Issued on February 3 following a three-day convention of the party, the statement opens with a harsh condemnation of the France-led war. It then proceeds to describe how the war policy in Mali is matched by sharpening attacks on the working class in France. The NPA has helped initiate a call for a demonstration (text below) in Paris on February 9 against the war. The protest will begin at the headquarters of AREVA, the giant French uranium mining and nuclear reactor manufacturer. The company operates several uranium mines in Niger, neighbour country to Mali, and is presently constructing in Niger what will be the second largest uranium mine in the world. But rather incongruously, the main argument in the commentary is that Canada’s participation in the French intervention “makes no sense”. Caplan appeals to the Canadian government to increase its aid to Mali from the paltry C$13 million boost announced last week. But he makes no reference to the engagement by Canada’s military since at least 2009 in the US-led militarisation of Mali and the region. Unfortunately for the citizens of France, the US, Canada and other countries pouring their militaries into Africa, and for the Africans themselves, it makes “a lot of sense” for the imperialists to deploy military forces in west Africa. These are the shock troops of an expanding neocolonial grab for resources that is documented in an important new article by John Pilger. Therein lies the foreign policy challenge that Mali presents for the workers of the invading countries. Do Canadians, for example, want a government that, in the recent words of Globe and Mail columnist Doug Saunders, pursues a “colonial turn” in Africa similar to its earlier turns in Afghanistan and Haiti? Or do we fight for a government that would join in the worldwide struggle against war, capitalist injustice and environmental destruction? NO to France’s war in Mali! The French government has been waging war in Mali for more than three weeks. Acting like a pyromaniac fireman, France claims to have extinguished a situation it largely created. Malian society has been eroded by years of structural adjustment programs imposed by the IMF, in the name of debt repayment for which France has a direct interest. And again, it is the French state, through ECOWAS led by Mr. Ouattara–well known for how much he owes to the French army for his accession to power in the Ivory Coast in 2011 – has fuled the political chaos in Mali, in retaliation for the dismissal in April 2012 of the corrupted President Amadou Toumani Touré who France supported. He also deprived the Malian army of its logistical means. A large part of the Malian population and numbers of Malian worker immigrants in France were relieved by the intervention of the French army against the oppression of religious fanaticism in northern Mali. But the French army in no way intervened to protect the population; it did so for its imperialist interests. It is not humanitarian reasons that are motivating the French war in Mali, but imperialist interests in the purest tradition of the actions of ‘France Afrique.’ Like a confession to a crime, this war allows France to send troops to secure the uranium mines of AREVA in Niger. This systematic exploitation by the French industrial trusts is consistent with the maintenance of government and state apparatuses allied to French imperialism that are corrupt and more interested in getting rich on the backs of the peoples than defending them. This was evidenced in Mali: when the jihadists arrived, the Malian army quickly ran off, leaving the population defenceless. Today, as the Malian army follows in the footsteps of the French army, we learn it has already engaged in retaliatory actions against a portion of the population, accusing it of being complicit with the Islamists. We can ask what new disasters and new massacres are being prepared during the reconquest of northern Mali by the French army and the armies of African countries, none of which is known for its respect for peoples. Yes, this is also true of the French army. We remember its role in Rwanda! To show our solidarity with the people of Mali, in all their communities, and to denounce imperialist war, which like all the previous ones–Iraq, Afghanistan, Somalia–feed only chaos and civil war and strengthen religious extremists, we call for a demonstration outside the headquarters of AREVA, 33, rue de Lafayette, metro Le Peletier or Notre-Dame-de-Lorette, Saturday, 9 February 2013 at 15:00. AREVA is the giant French uranium mining and nuclear reactor manufacturer. It has 50,000 employees and annual revenue of app. $15 billion. It operates several uranium mines in Niger, neighbour country to Mali (http://eafes.eu/Nene%20Diallo%20-%2... See on ESSF (article 7607), Ça chauffe: les cheminots avant la grève du 18 octobre.). 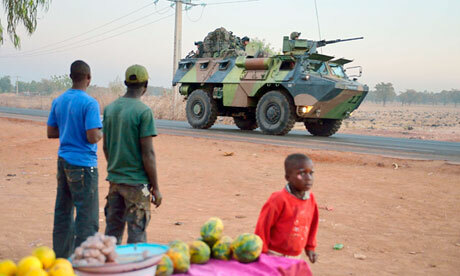 Further concealing aside, France is assuming its responsibilities with the military intervention in Mali. François Hollande reminded listeners of it in Timbuktu and Bamako on Saturday, Feb. 2, without arrogance or postcolonial complex. He reiterated the intention of France to remain in Mali for the time it will take. Paris has long sought to avoid appearing on the front line in this former colony. The fate of French hostages kidnapped in the region but held for months in northern Mali by Al Qaeda in the Islamic Maghreb (AQIM) was a reminder of this resolve. Behind the scenes, however, Paris was at the forefront. Its diplomats wrote resolutions at the Security Council of the UN to ensure the legality of military intervention. Its expert were working alongside officers in West Africa to put in place a regional intervention force designed to release the grip of the narco-Islamists that controlled nearly two-thirds of the country during the previous year. Because the problem of Mali far exceeds preserving the backyard of the former colonizer. The cancer that developed in Mali – the alliance between Islamist groups and drug traffickers – threatens the entire region. The spectacular seizing of hostages at the site of the gas works at In Amenas in Algeria by a group linked to AQIM illustrates the reality of this threat. It shows that the range of terrorist groups extends away from their bases Gao or Timbuktu, where they were trying to install their sanctuary. To be convinced of the danger, it is enough to note the degree of mobilization of Côte d’Ivoire, Nigeria, Senegal, Niger and Chad. From the beginning of the crisis in Mali, they called for urgent military action. Certainly, the countries of the region have geopolitical ambitions. But Mali is not Congo – Kinshasa. Its sub-surface is not full bursting with wealth that drives ambitions. The central issue was security as well as to contain a threat that might spill beyond the vast, arid Sahel region that runs from Mauritania to Djibouti. France has understood this from the beginning. In his speeches, François Hollande has consistently pointed to a threat of regional destabilization. This made clear that Paris was not preparing to intervene to defend a friendly regime at risk. The French President promised not to repeat the less than glorious episodes of the history of “Françafrique”. In Bamako, on Saturday, he went further, saying that France was paying a debt written in blood in Europe by African soldiers who died for France during the two world wars. He was right, but that does not detract from the relevance of the question today: how to conclude? Paris is counting on African forces to take over, but they are not ready. Reality obliges that this unpleasant truth be stated. If Africa and Europe do not want a French tutelage over Mali, then they must assume their responsibilities.